PERBIX has been Tesla’s (NASDAQ:TSLA) vendor for designing and building automated manufacturing machinery for the last three years. Tesla’s SEC filings state that the privately-held Minneapolis-area company was acquired for at least $10.5 million in stock. Breitbart News reported last week that Tesla’s stock plunged $5.5 billion after CEO Elon Musk on the company’s third quarter earnings call stated that production of the new high-volume Model 3 would be delayed by six months. The news devastated investor confidence and caused the yield on its $1.8 billion of bonds, issued less than 3 months ago, to spike to 6.5 percent, a level associated with junk bonds expected to default. Musk blamed delays on its $5 billion Gigafactory battery supplier in Reno, Nevada, but avoided questions about being sued for laying off 7 percent of employees without notice at Tesla’s Freemont, California, assembly plant. Musk also acknowledged automated volume production challenges of the Model 3, compared to the company’s largely hand-built luxury Model S sedans and Model X SUVs. 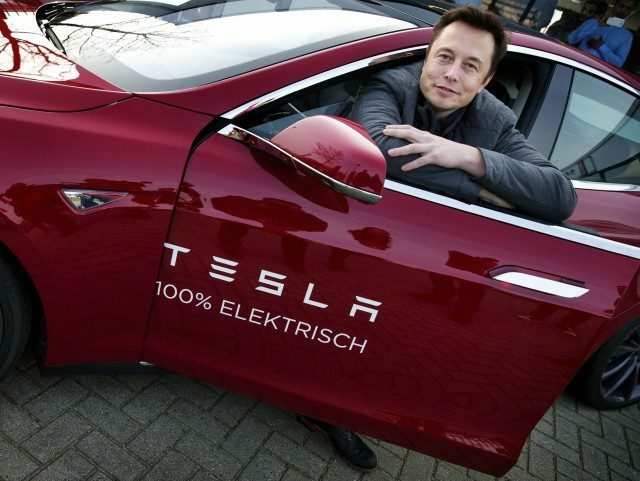 But he emphasized that through “physics-first principles,” Tesla would shape a new mode of industrial production to improve efficiency by “factors of 10 or even 100 times.” He repeated Tesla’s key advantage in building all-electric vehicles was limiting the number of moving engine parts to 20, versus up to 10,000 for internal combustion engines. Breitbart News highlighted that the Daily Kanban industrial blog reported Tesla only gave PERBIX a purchase order for “Body in White” (BIW) robotic-enabled Model 3 production lines earlier this year. Although car companies normally place fully-designed orders for fully-tested BIW lines with at least a two-year lead time, Tesla asked for a four-month delivery and planned a risky “cold build” layout and quality testing at its own factory. But Tesla only built 260 of the 1,500 Model 3s scheduled in September. Instead of hitting the promised 10,000 per week in December and 500,000 for 2018 projected in the company’s 10-Q, filled with the SEC in July. Tesla’s stock crashed when Musk said the company would not achieve even 5,000 per week until late March 2018. More concerning is Tesla’s just published SEC 10-Q filing, which states that Tesla can only achieve 5,000 Model 3 cars per week without adding capacity. That tends to confirm reports by top Seeking Alpha analyst “The Montana Skeptic” that Tesla never ordered a second BIW line from PERBIX, despite guiding investors to assume the company already had Model 3 production capacity of 10,000 vehicles per week. PERBIX automation was founded in 2001 and has an excellent reputation with Fortune 500 manufacturers for automation expertise. Its 150 member highly skilled technicians should be a big help to Tesla’s manufacturing ambitions. But Tesla was holding roughly half-a-million in customer pre-order deposits for the Model 3 as of August. The company was burning cash from operations at the rate of $16 million a day in its third quarter ending September. It is currently unknown how many cash deposits Tesla has recently had to refund due to Model 3 customers due to long delivery delays.